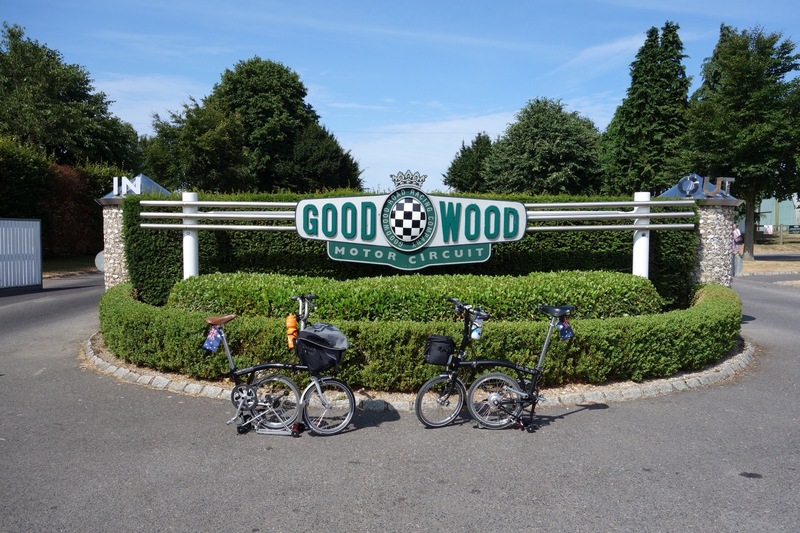 A wonderful time at BWC2013 was surely had by all who travelled to the Goodwood Motor Circuit, Chichester. For our first BWC trip & to this new venue we took a cottage at Pagham nearby & drove Kanga up each day. Our cottage location incidentally, used to be the home for Derek Bell, the multi-winner of Le Mans & his early racing career at Goodwood was for the family-run Church Farm Racing Team. Staying near Goodwood & seeing light aircraft doing aerobatics overhead, reminded me that Goodwood also has an aerodrome in the infield. At the circuit there were historic sights aplenty: the buildings & infrastructure, famous racer names for parts of the track, “Goodwood Revival” pre-1966 historic support vehicles, bronze statues of renowned racers & flyers & also the regular take-offs (with the occasional aerobatics) & landings by an assortment of aircraft, including Tiger Moth & WWII warbirds. An atmosphere that just seemed so appropriate to the BWC? Our late-afternoon Friday attendance was intended just for BWC registration & race-pack pickup but the setting & atmosphere was very entertaining. Some hours were spent cruising the exhibit area & we fielded countless enquiries about aspects of Ralph & Robinson’s setups – eg my small luggage bag, bidon cages, MKS pedals, Alfine 11-speed, etc. Perhaps I’d better start a Brompton-modding business? Saturday & day 2 for us was to spectate the Sprint & Eliminator events & start meeting many of the Facebook group London Brompton Club members – & especially Mick, LBC co-founder (thanks Mick, for those Facetime chats for advice on pre-trip matters). So many (& too many?) 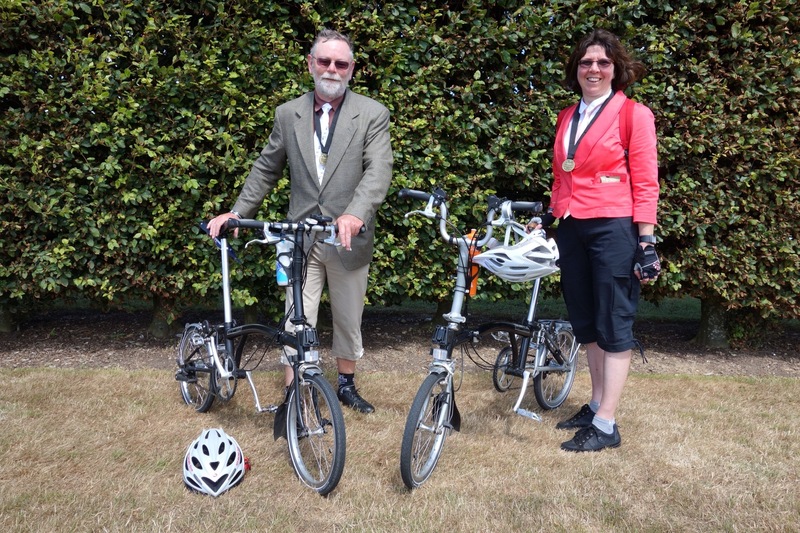 LBCers to put faces to names & Brompton pics? 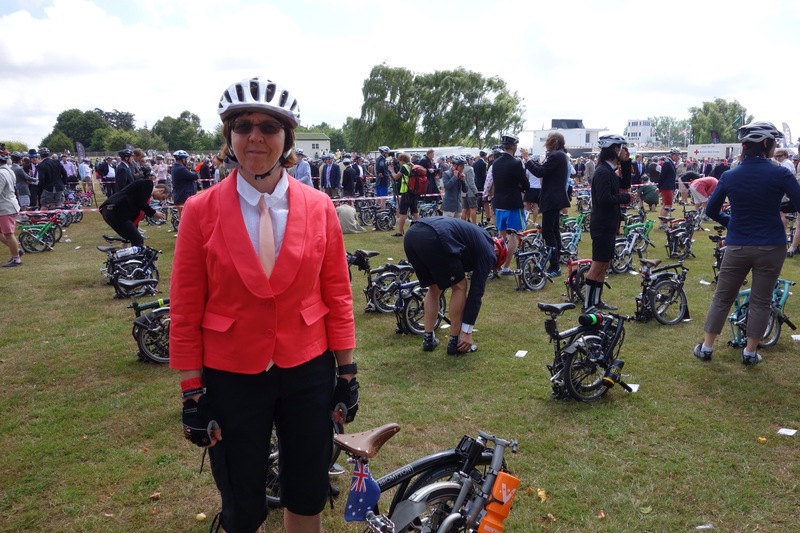 A great day & I was starting to suspect that the non-Brompton events at this “Orbital Cycling Festival” were a minor player – & that “Brompton-Sunday” was going to be massive? Day 3 & Sunday dawned bright & exciting, headed off early for a fast-paced, blur of a day? Bromptons galore being unloaded at the car park & starting to see some wonderful outfits for this “business-attire dress-code day”. Off on a sighting lap & a familiar face pulls up alongside: “World’s Fastest MD”, Will Butler-Adams – & a very productive chat? (more news later?) Endless pre-race chatter/meetings with LBCers & others, before a “Field of Folded Bromptons” are assembled on the grid. Who can run in such congestion? Stayed calm & got it all together, dodged through those still bums-up unfolding & clipped in & away! Kept off the racing line & watched swarms of Bromptons continually coming by – & then the later waves just kept whizzing through! With my heart rate “digitally restricted”, I was headed for a steady (but flat out?) ride – although the head winds were tough & the Alfine trigger shifter got a work-out to keep my cadence up. Certainly jolly hot work; new outfit next time? Had a marvelous “grandstand seat” in watching never-ending Bromptons circulating. Got lapped twice by the leaders (such a fantastic pace & legs a blur) & once by my wife (creditable 36:54 for 11th in class & her first race) – but still a lap to go for me? So tempting to “take the medal & end it all” but I soldiered on – & even managed to chat with a fellow sufferer from the Netherlands before crossing the line & stopping my Garmin at 51:16 (race timing spot-on!). Now that’s how you get your “money’s worth” in racing – before getting stuck into the recovery food & photo sessions. You had to be there to enjoy the afternoon tea – with Brompton staff wielding endless tea pots – the Gin & Tonics, & finally the exuberant presentations. Was there a brief shower about now? I don’t think too many noticed. Beforehand, some said that the numbers would be down because Goodwood lacked the hills & atmosphere? I feel Goodwood was an excellent location (even with the head winds?) – & I suspect lots more will think that next time? 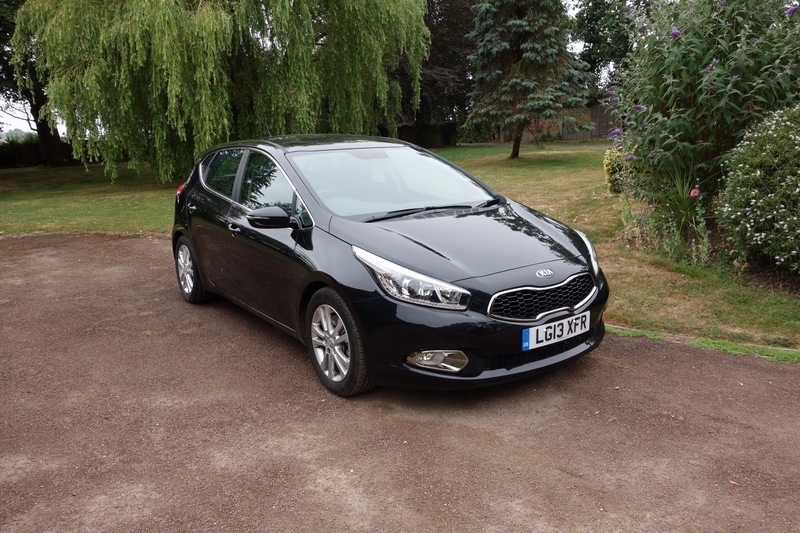 A name for our UK rental Kia Cee’d Eco has been suggested as Kanga (maybe related to my driving?). Without any driving manual supplied, I’ve resisted the urge to try reading any info off the Internet & just make do with some “on-the-job” training. Interesting little car, a turbo diesel manual with an “Eco mode” that turns off the engine when stationary, out of gear & with clutch out – but turns the engine back on when depressing the clutch. The dash is a maze of warning lights, gauges & dials & something new is noticed every day. Also, the first night-time drive was confusing, with varying light levels noticed before realising that there were directional lights that came on when the wheels were turned. I’m guessing we’ll learn more as we go along? 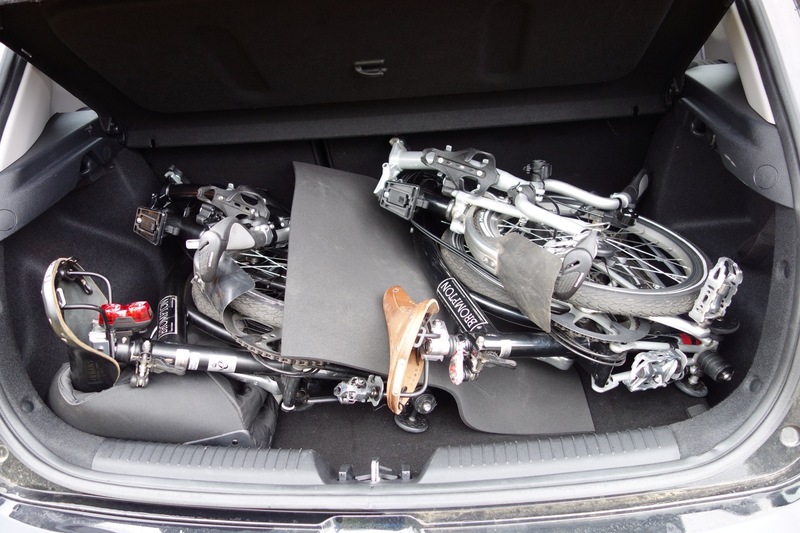 The important question was whether it would fit our Bromptons in the boot (as we’d booked a VW Golf after testing the Brompton fit – but realised that we may receive “an equivalent”). I’m pretty sure that the boot is smaller overall (especially with the rear wheel arches intruding?) but things fit. My initial loading determined that the saddles were best located in the outer rear corners & with a slight overlap of the wheels. Once in our first cottage stay, I rearranged things by folding up one of the bike bags & placing it to one side, then putting Ralph on an angle on top, with the saddle turned 90° & nestling into the end of the bike bag (& both removable pedals taken off). Robinson was then placed on the same angle beside Ralph, with the saddle resting on Ralph’s folded front wheel (with some padding between). On daily trips the Bromptons ride along in the boot (wearing their covers, if necessary), while helmets, bags, etc are carried in the cabin (& the 2nd bike bag is left in the cottage). 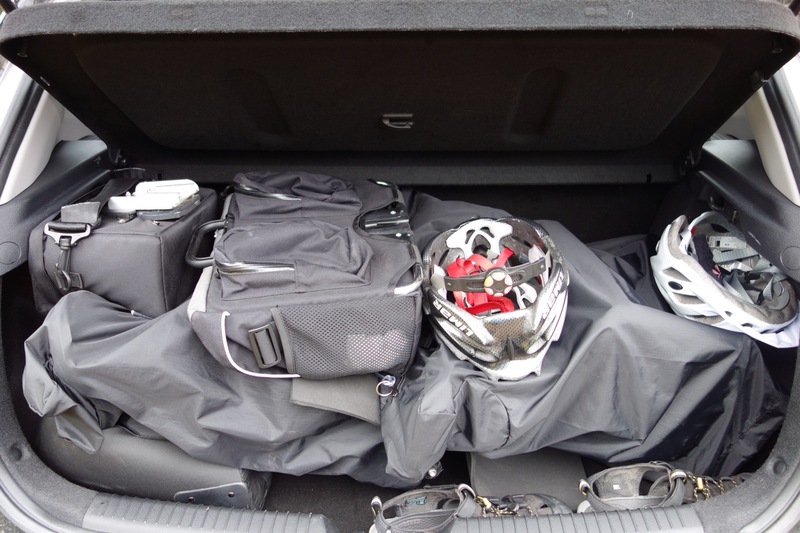 When space is at a premium when moving on to the next of our weekly cottage stays, we can cover the Bromptons & place luggage bags & helmets in the boot & carry the 2nd bike bag folded up behind one of the seats. I could probably carry the Bromptons & all luggage in a number of ways but this setup lets the bikes stay out of sight. The urge to upgrade to a larger car is best avoided, with dearer rentals, high fuel costs & no doubt many narrow lanes to negotiate? This travel lark is rather hard work. Getting into London at 5am after a 13hour BA flight (on which I inherited a broken headphone socket & a super-hard seat squab) was the start of a wearying day. Heathrow added a little amusement with a gift “Celebrating a very special new arrival” but we weren’t fooled; it was for Will & Kate’s new arrival, not ours. Early arrival hotel check-in was completed & then a freshen-up before heading off to acquire 3G Sims for iPads & iPhones. Having researched carriers & Sim availability, it was interesting that we needed to find an O2 shop to get what we needed (rather than expect product knowledge at multi-carrier outlets?). Day one then moved to wind-down mode, with a great pizza & Aussie red wine at the hotel – & then into a lovely comfy bed! I couldn’t resist a visit to the Singapore folding bike shop “Mighty Velo”, listed as selling Bromptons, as well as Strida & Montague bikes. Situated within a light industry area (containing a typically Asian endless variety of fascinating shops dealing in absolutely everything? ), the neat, small frontage opened into a well stacked display of bikes & accessories. Immediately I could see that my trip was going to be worthwhile, with lots of Bromptons & neat shelf displays of folding bike stuff to review. Just looking, mind – but the small shop layout was a delight to observe. Topping one rack was 4 Limited Edition Bromptons; my first sighting of such bikes was to be this set of Royal Wedding, London, Jubilee & Barcelona models! Another first sighting was the coloured solid-rubber tyres that I’d read about. 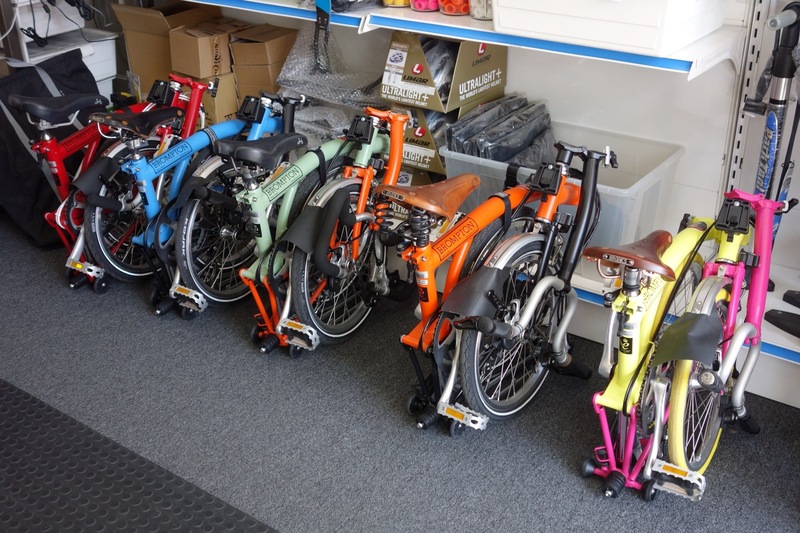 With about 10 varying colour Bromptons in sight, as well as coloured tyres & grips to choose from, it was fascinating to watch customers “mixing & matching”. Singaporeans seem to like colours with their bikes! After checking out various accessories, including Monkii cages & Akslen lights (more first-sightings for me), I could have happily walked away. However, while taking some photos & chatting with the assistants, I was told by one female assistant, “oh, you should meet the owner…” & they disappeared into the workshop. Out came the owner, Vivian & introduced herself, chatted & proceeded to give me a full tour. What had seemed to me to be a good stock of Bromptons, turned out to be just the demonstrators! (in every handlebar style, various saddle-types, all the transmission models – along with the frame colours & coloured & normal tyre choices!) 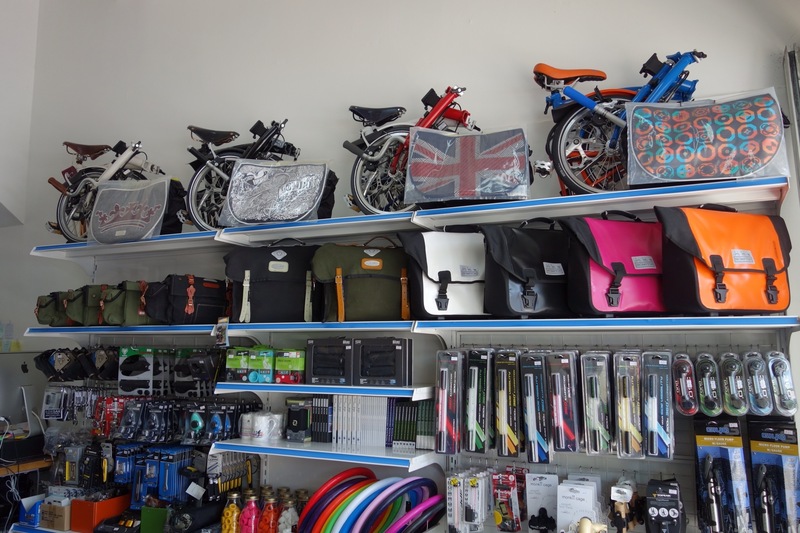 To assist the choice, a customer could be taken into the workshop & able to see all the shelves of stock bikes (according to Vivian, “the most two-colour bike stock of any shop”), which I estimated at over 70 bikes – but then there was the storeroom behind! At this point I was distracted by being shown a couple of Mando Footloose electric bikes (from the designer of the Strida bike, Mark Sanders) & having an explanation of Singapore’s eBike rules & regulations! All very exact & restrictive in an emerging market? Yes, I couldn’t resist a purchase or two. While a customer picked out a Brompton Oratory jacket, I snapped up a pair of Brompton cycling socks (I had been wondering if my choice of socks for the BWC would do?). Also, I just had to take some Singaporean Brompton Velcro straps. I have a use in mind for securing things, although Vivian explained how they came about: it seems that Singapore’s MRT transport system is very specific about bikes being folded before travel – so R-model Brompton owners can fold their bike but leave the seat up to ease pushing/rolling & still retain the frame locking via the strap fastened around the frame & rear wheel? Some practical “local bling”? Oh yes, a few Montague bikes were sighted as well as probably about 20 Stridas? 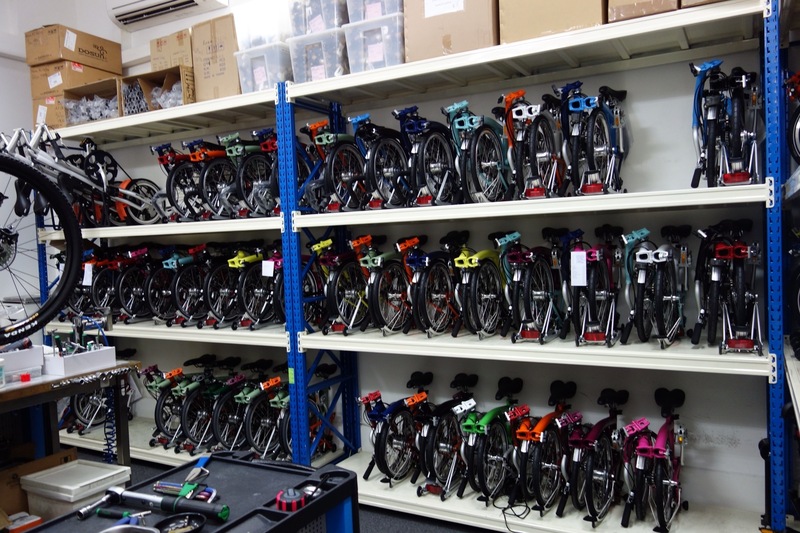 My apologies but the Bromptons were a bit overwhelming… Now let me see, maybe another trip to Singapore & a visit to Vivian’s workshop & storeroom, finishing with a thorough explore (on the new Brompton) for a couple of weeks? I like Singapore – although my visits have been few & just shortish flight stop-overs. 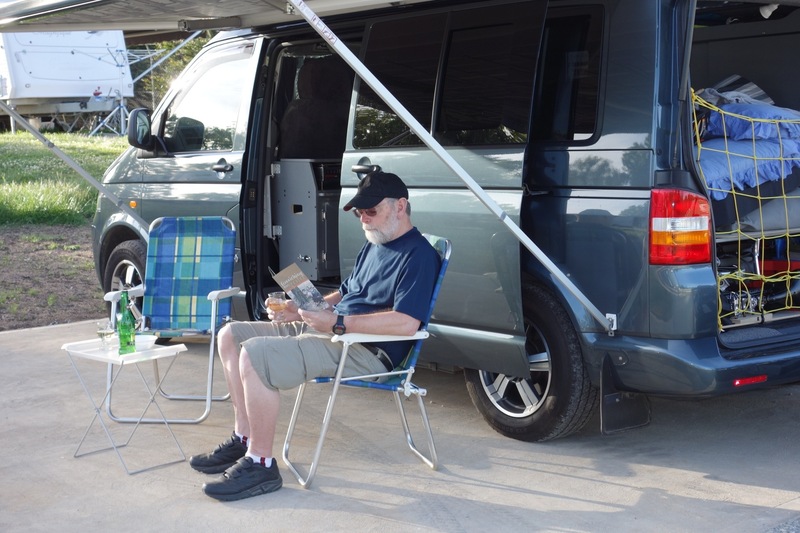 An ideal stop-over before our UK trip: as in Australia, RHD vehicles & lots of English spoken? Sadly I’m not sure when or if there will be a repeat, as this one was booked prior to the Qantas/Emirates tie-up & it seems that Dubai is the new Singapore for Qantas Aust/Europe flights (maybe I should say no more until I encounter a Dubai stop-over on the way back to Australia?). I was almost blown-away by the hotel breakfast on the first morning. Well. yes the food was good but I encountered a gale when entering the serving/seating area. 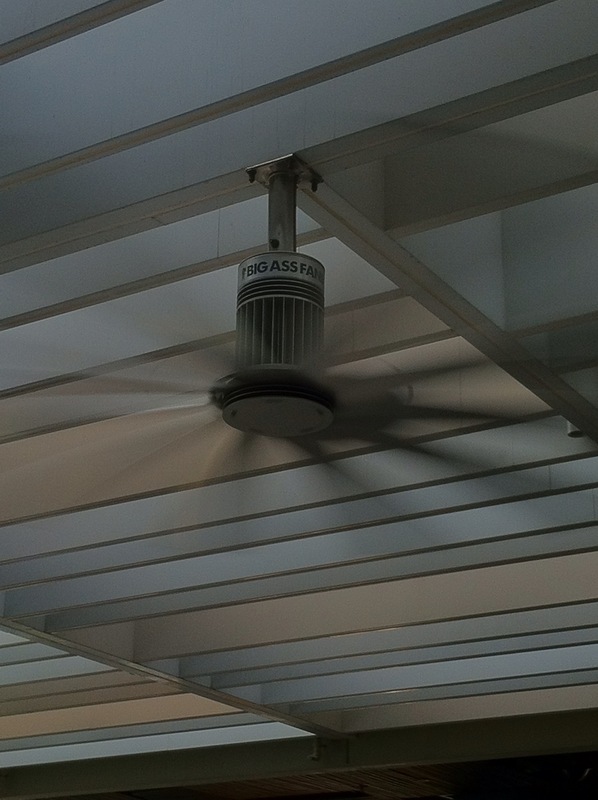 Looking up, there was probably the fastest, biggest, most-bladed fan I think I’m ever likely to see! Having a closer look, I noticed the name on the body. Later, for curiosity I thought I’d Google it to learn more. Just as the website selection was starting, my hotel WiFi login screen was presented (again?). Once (re-)agreeing to the terms & conditions I found that another search returned nothing anything remotely like it!? Momentarily puzzled, I then realised the WiFi was filtering out my search term (too offensive?). Oh well, I’ll resume my search for “Big *ss Fans” on another leg of the journey. Ralph & Robinson seem to have survived the journey unscathed – as far as I can feel? They’ve remained bagged so far – owing to the shortness of stay? – & even though a Brompton is a great way to get around, seeing the Singapore sights involves a lot of looking up! Also, the weather is mostly “hot & steamy” & I gather that good riding times here are very early & very, very late – times inconvenient for now? The last day of the stay here is Monday & that’s an opening day for the Singapore Brompton dealer, “Mighty Velo” (closed Sunday & Tuesday?). I shall try to find this little shop; sounds appealing by what I’ve read? Ralph & Robinson have been packed for some days, awaiting their trip “home” (& their participation in the BWC 2013). We’re almost ready to go, just “fine tuning” what & where everything else will go. 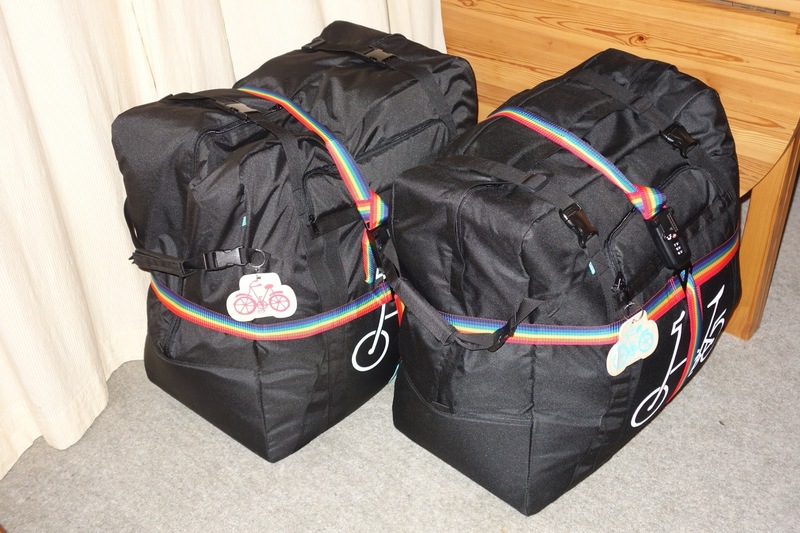 The pressure’s off really, because the theory seems to have worked out, with my expectation that we could get by with just a Brompton bike bag & a single cabin bag each. For more than a year I’ve been looking at bag systems, wondering how to cope with the air travel baggage allowances for economy patrons such as us. Buying Robinson & inheriting a Brompton B bag was the start but I later realised that the bag was an earlier model & was an extremely tight fit (maybe from the Brompton SWB-days?) let alone having much space for travel clothes, etc. Researching other choices wasn’t very encouraging but then I noticed the new Vincita bag for Brompton (B132 model). This bag from Thailand seemed a similar style to the Brompton B bag – but much larger. It was even thought by some users to be too big & the manufacturer had also produced a more tapered-shape bag. My preference was for the earlier bag & as it was still available, I crossed my fingers & ordered one. If it worked out, the plus point was going to be that it seemed astonishingly good value; even with a large air-freight cost it was half the price of a B bag! When it arrived it looked like it was going to be ideal; good quality, spacious & well-engineered? When Ralph was obtained, it came with a (well-worn) B&W hard-case. For me, one factor against using it was the issue of storing/transporting it while traveling around by rental car. Once Ralph was equipped with Ergon grips & come the final planning for a trip to the UK, the possible use of the case was resolved when I found that the lid wouldn’t close – I was going to be up for some bike disassembly! Back online to Vincita & an order for another B132 bag, this time not bothering to request the earlier large bag & expecting that the later bag would be suitable. So, this week saw everything come together & I was rather relieved that there are no last-minute dramas or changes of plan! My slightly smaller Vincita bag has Ralph (wearing a Brompton cover), the small Axiom on-bike luggage (containing various spares & bits), 2 pair of shoes, a lightweight suit-bag (containing clothes – definitely no suit!) & a couple of small stuff-sacks. Robinson (also wearing a Brompton cover) in the other Vincita has a Brompton C bag (with frame & bag separated) & a myriad of packing cells!? (It probably wouldn’t be safe to describe what my wife is packing – but it seems to have fitted?) Onto the scales & they’re in the range of 26-27 kgs – fitting within the checked-luggage allowances for our planned flights. Oh, & the bags comply with the 158cm dimensioning restrictions! Rather weighty & bulky but then it’s not just the BWC we’re heading for! Oh, & how’s the Brompton packing been arranged? 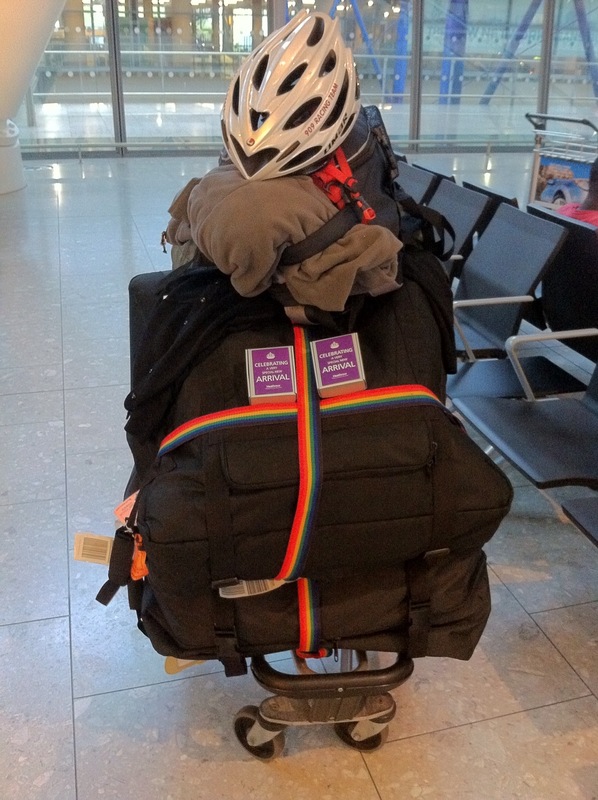 Most travelers seem to recommend removing the saddle so off it came & got bubble-wrapped & placed between the front end of the wheels, with straps containing the saddle & tensioning the wheels together (with partially deflated tyres – just in case?). Next the hinge bolts & Brompfication clamps (& springs) came off & got bagged (although I wondered about some advice to just do up the clamp bolts? It seemed risky for any major strike to the bolt head area & so I decided that naked was best – but added padding to the hinge faces). Padding was also attached (via tape, straps or removable cable ties) to the handle bars, seat-post top, LH crank arm (remembering that I run MKS removable pedals), along with a large piece of dense foam placed inside the bag on the RH side (ie extra padding for the handle bars?). That’s it – now to trust the Vincita padding & clothing (in a suit-bag placed inside the bag on the LH side). Do you fly up hills on your bike? (whether it’s a Brompton or whatever) Do you wonder why your effort seems so ineffective in comparison to others? There are lots of variables that affect our ability to get up hills comfortably & there are many theories as to what you need to do to improve (eg lose weight, buy a lighter bike, ride the bike more, harden up, etc). For me, some years of cycling club riding gave me plenty of opportunity to witness those riders who could “disappear up the road”, especially on big or long hills. On the flats or smaller rolling hills maybe I coped & kept with riders of an assortment of body shapes & sizes? Throw in the longer hills & there was still an assortment of rider sizes, but once the toughest of hills came along then probably the first up were the “weight weenies”? (can’t be sure from where I was on the road?). Time trialling was an enjoyable thing (sort of) but illustrated how some riders had astounding performance. What was their secret? So, how’s my hill “performance” post-virus? Hmm… definitely slow on long hills but I’ve come to relish my Brompton, Ralph. If I slow down before I’m fatigued, put Ralph into my super-low Alfine 11-speed first gear & then just pedal slowly, look at the scenery & keep going (until I feel like stopping/walking?) then the hill disappears. Maybe “almost normal” & with my limited blood oxygen supply, if I operate at a level where the muscles are satisfied then riding’s good! I recommend it for everyone!